Hi friends, this week runs very fast and now the weekend going to start. 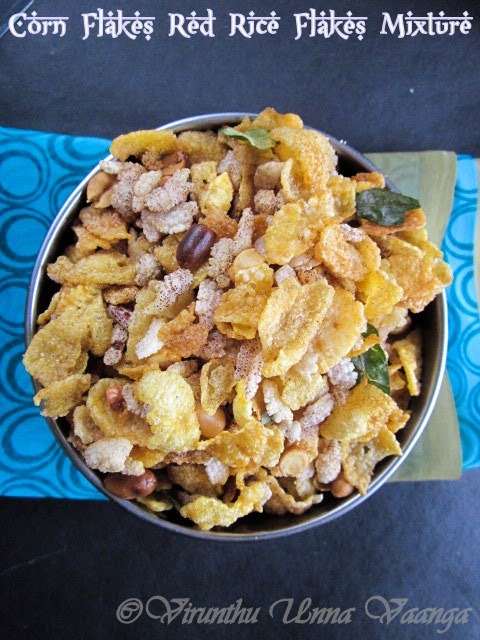 Today’s post for Cooking from Cookbook Challenge which is initiated by +Srivalli jetti from Cooking 4 all Seasons. 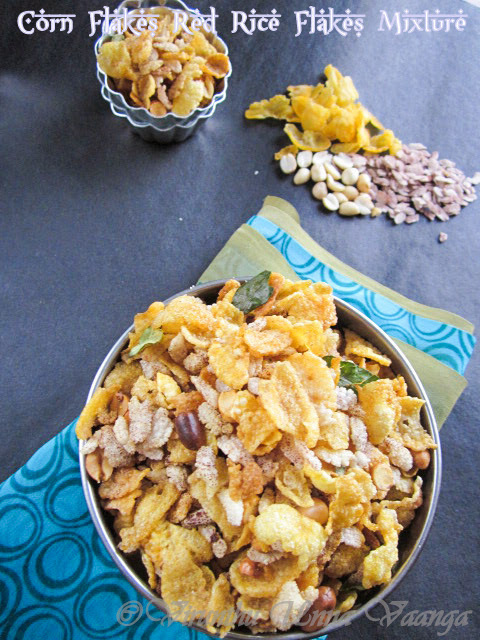 I prepared the hot and crispy mixture from Aval Vikatan supplement book. 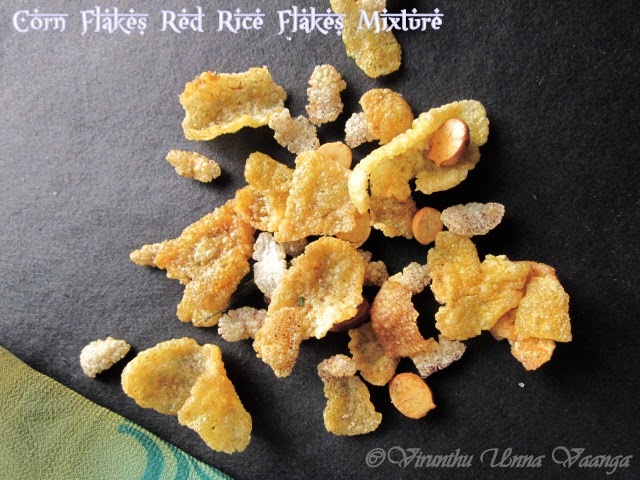 In original recipe, they used white rice flakes (White Poha), but for a change I used red rice flakes and other thing was I don’t have white rice flakes while am making the mixture…:P But it came out very well and is apt for cold weather. 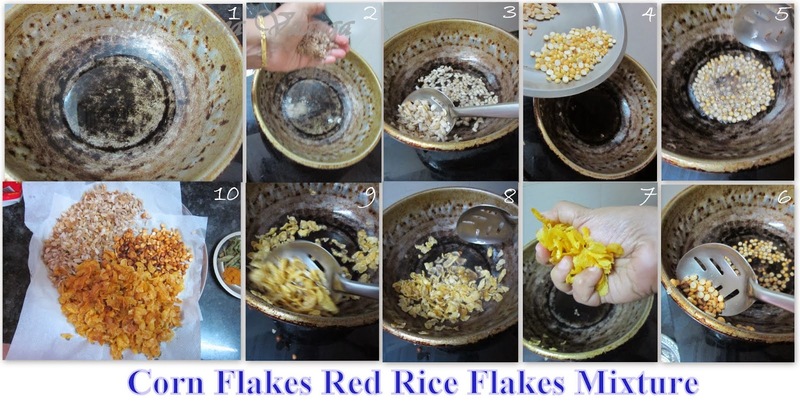 Fried the red rice flakes in low flame; it will be burn while frying on high flame and take out from the oil and keep it in absorbent paper. Then, keep the flame to medium flame, add fried gram dal, fry it till golden brown and take out from the pan, then keep it in absorbent paper. Then fried the peanut till golden brown, take out, followed by add corn flakes and fried it and take out. 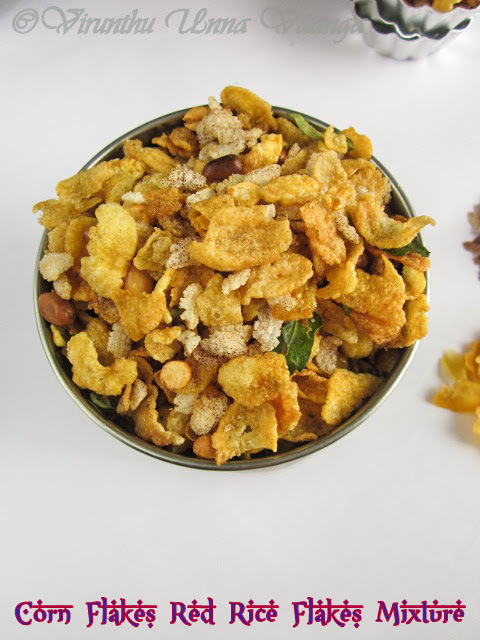 Mix the all fried things in a wide big bowl; add salt, red chilli powder and dry curry leaves mix it well. You can substitute white rice flakes instead of red rice flakes. Add little pepper powder instead of red chilli powder. If you like garlic flavor, deep fry the some garlic flakes with skin and add it with the mixture. You can add deep fried fresh curry leaves. Love to munch it anytime viji. I love this cornflakes snack. I haven't eaten this in a long time. 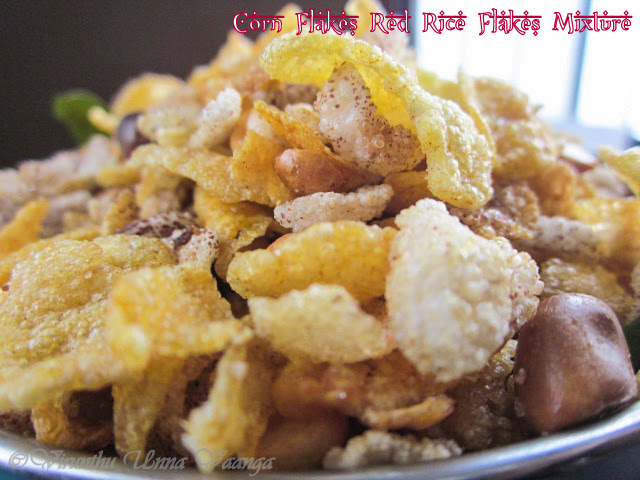 In fact I bought some cornflakes 3-4 weeks ago to prepare this mixture but never got around to making it. Just like corn flakes, we also get white flakes. It is made of rice or sabudana, I don't remember and look just like the corn flakes, but white/transparent whitish in color. Those flakes go will in this mixture. 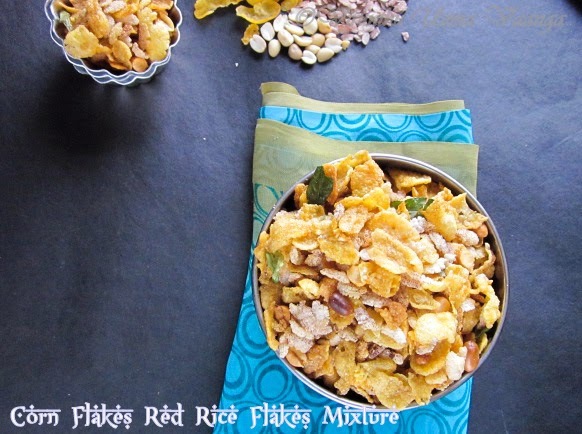 Even your flakes mixture looks delicious and I can finish off that bowl in minutes. .
Nice and delicious snack, Viji!! Iove to have this with cup of tea now..
wow with red rice it looks really good. 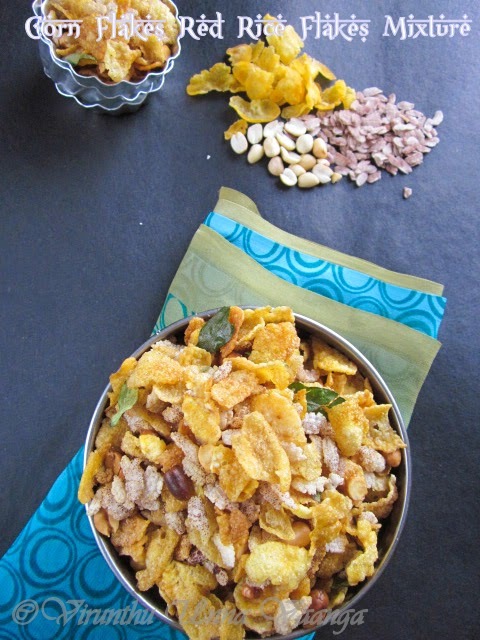 Very healthy and crunchy snacks. yummy one I love it a lot so easy and so tasty. That's such a delicious treat! I haven't tried red flakes till now. Will look for it in the grocery store. 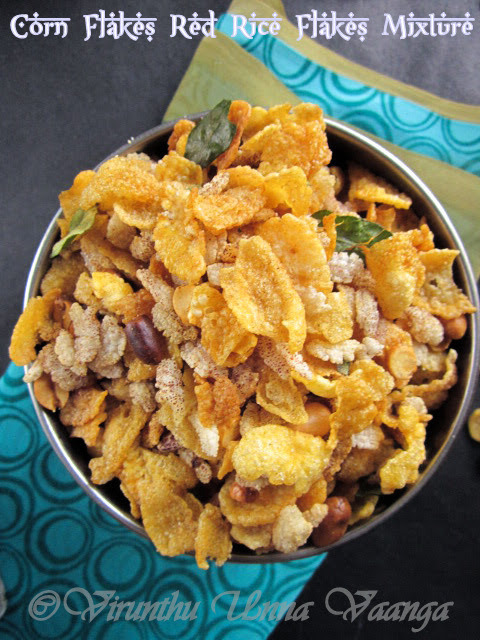 Mixture looks crispy and crunchy -- perfect tea time snack. Wonderful tea time snack , looks so crunchy and yummy !